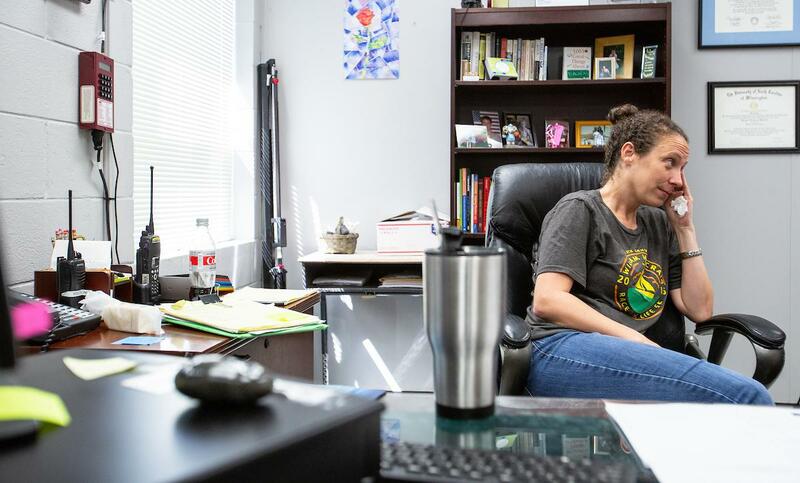 Principal Maggie Rollison of Trask Middle School in Wilmington, N.C., fights back tears while recalling her experience as a "shelter principal" during Hurricane Florence, which caused extensive damage to the city and has kept students away from school for weeks. “When I came in for this I thought, ‘I'll just have time to work.’ I'll get a ton done because we don't have to do anything – usually,” recalled Rollison. But she was in for a surprise, "We were the first school to open in the district and we were at capacity or near capacity almost immediately." WUNC's Liz Schlemmer reports on a Wilmington school trying to get back to normal after Hurricane Florence. Three weeks after Hurricane Florence made landfall in southeastern North Carolina, schools in New Hanover County are re-opening to students. School officials -- and their buildings -- weathered the storm, and for the following weeks, staff have worked hard to meet students’ needs even before they could return to class. The media center at Trask Middle School in Wilmington, N.C., was one of the rooms that flooded during Hurricane Florence, when the building was being used as a shelter for hurricane evacuees. For several hours before the storm, Rollison helped check in families, and their pets. Meanwhile, her own 8-year-old daughter Caroline was also staying with her at the school. “She felt like this was some kind of slumber party like she had an air mattress in my office. She wanted to eat lunch in the cafeteria with everybody, like she she thought it was great,” Rollison said. When the wind and heavy rain finally came, it made for a long day at the middle school. The day started around 5 a.m. with an unexpected arrival of an elderly couple, that had watched their house burn down because no one could help them. They came in their wet pajamas. School staff rummaged through ‘lost and found’ to give the couple dry clothes and assign them cots in the hallway. Hours later that hallway would fill with water. The roof’s drain pipe in the ceiling of the school’s shop room busted from the immense flow of water and fell to the floor. 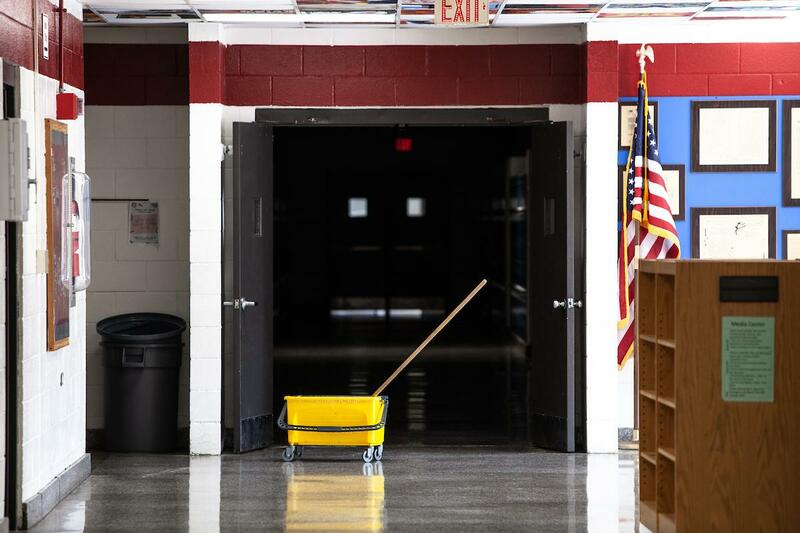 A worker removes dehumidifying equipment from a hallway at Trask Middle School in Wilmington, N.C., on Thursday, Sep. 27, 2018. The school was used as a shelter during Hurricane Florence, which casued extensive damage to the shool and the city as a whole. Rollison was called to the scene. “Basically our entire roof was draining into this one classroom. And so a huge trash can, like a regular school-sized trash can, would fill up in like 10 minutes,” Rollison explains. Water flooded the huge room, then creeped down the halls. Shelter staff moved residents into classrooms and the gym. Late at night, a nearby neighborhood flooded. More families came in, including a few of Rollison’s former students. All in all, Rollison had a 20-hour day and was running out of steam. The next day, her superintendent came to relieve her and she and Caroline went home to rest. Rollison went to bed early and in the morning woke up sleepwalking. A hallway at Trask Middle School in Wilmington, N.C., on Thursday, Sep 27, 2018. The school building was being used as a shelter for evacuees from Hurricane Florence when a pipe burst in the ceiling and caused extensive flooding inside the building. Now, Rollison’s focus is on helping her students who faced the worst of the storm. Just days after the storm, she began calling students to check on them. Days after the storm hit, shelter guests moved to another school. That meant Rollison and her staff could tend to the building, and their community. But before they could get students back to school, the middle school started reaching out, to offer some help. Guidance counselors called students. The assistant principals home-delivered boxed lunches to families. A binder detailing emergency operation plans hangs in the media center at Trask Middle School in Wilmington, N.C., on Thursday, Sep. 27, 2018. The building was being used as a shelter for evacuees from Hurricane Florence when a pipe burst in the ceiling and caused extensive flooding inside the building. 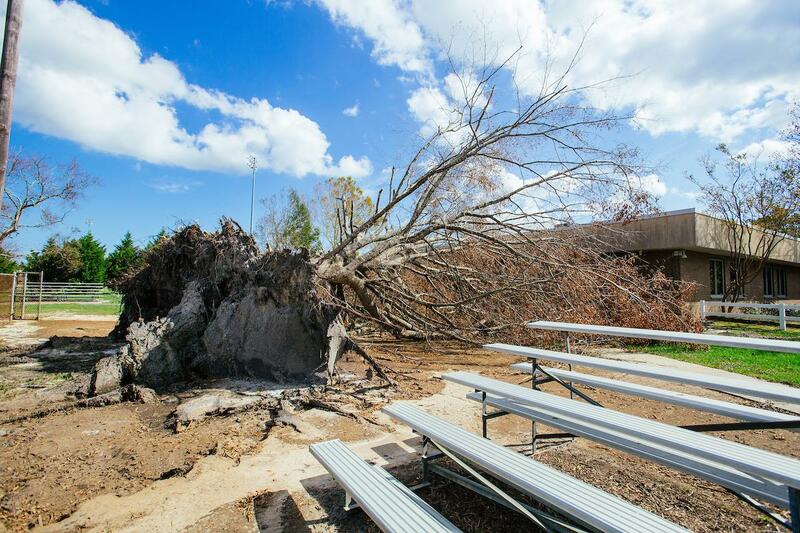 There’s still plenty of damage to assess and deal with, and many schools in the district are worse off than Trask. After a rapid clean-up, the school quickly went from being considered one of the most damaged school in the county, to one of the least. 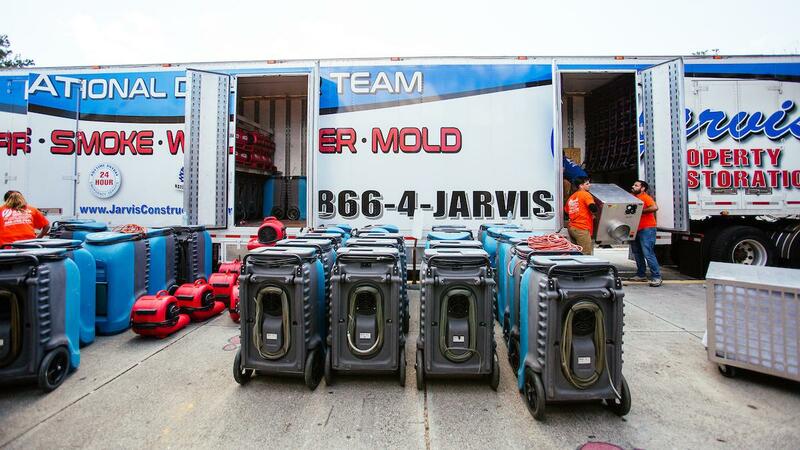 Because the school kept generator power and air conditioning on throughout the storm, it didn’t suffer the same mold and mildew issues other schools faced. 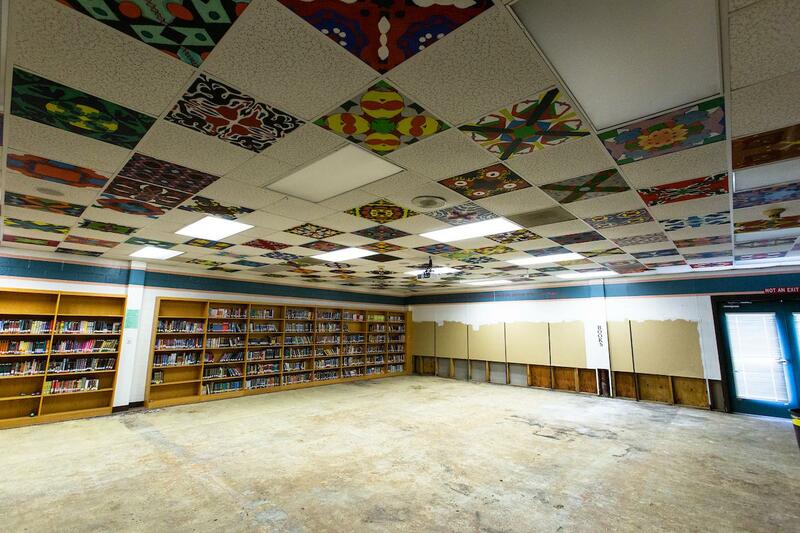 Still, the school’s media center is out of commission until water-damaged walls and bookshelves can be replaced, and two trailers that house classrooms have to be gutted. 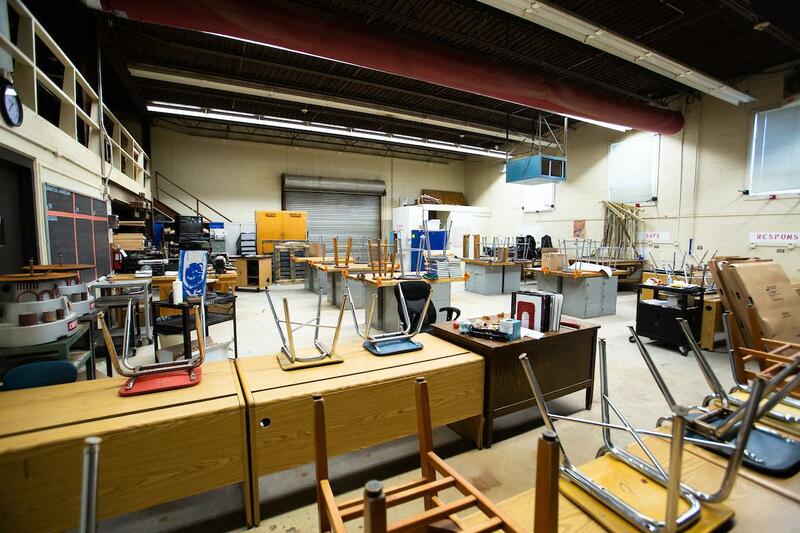 Those teachers will teach from mobile carts, while their belongings are stored in the weight room. Rollison has a framed spreadsheet on her office wall, a teasing gift from school staff who know her love of logistics. Now that love, and skill, will be tested in the weeks ahead. Workers load dehumidifying equipment into a truck outside Trask Middle School in Wilmington, N.C., on Thursday, Sep. 27, 2018. The school was used as a shelter during Hurricane Florence, which casued extensive damage to the shool and the city as a whole. 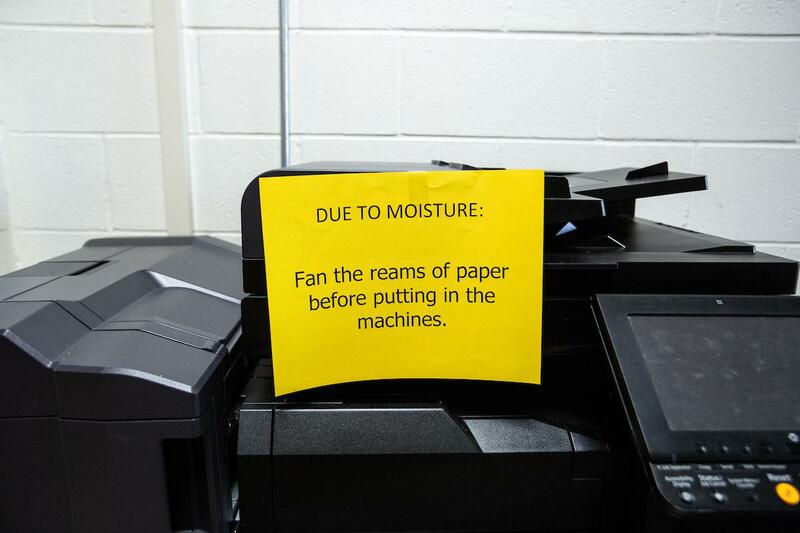 A warning is taped onto a copy machine at Trask Middle School in Wilmington, N.C. on Thursday, Sep. 27, 2018. The school building was being used as a shelter for evacuees from Hurricane Florence when a pipe burst in the ceiling and caused extensive flooding inside the building. 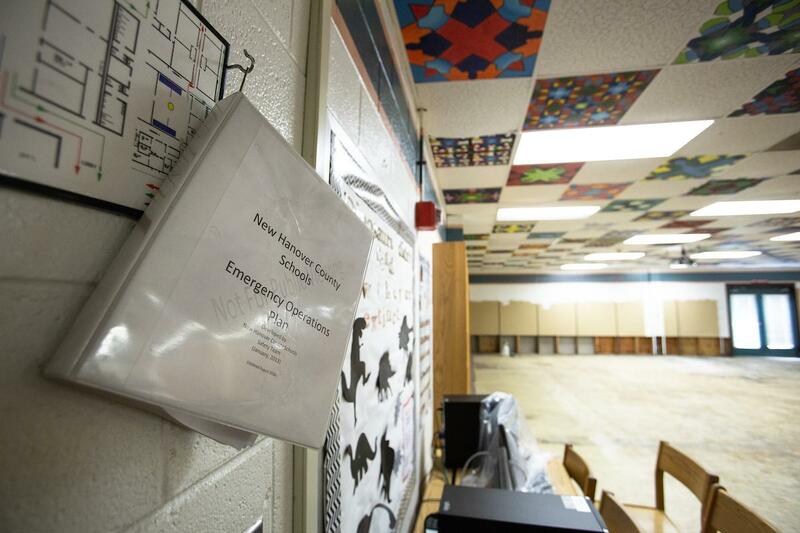 While Trask Middle School in Wilmington, N.C., was being used as a shelter for evacuees from Hurricane Florence, a pipe in the ceiling of this classroom broke and caused extensive flooding throughout the building. An insurance inspector photographs damage inside a classroom at Trask Middle School in Wilmington, N.C., which was used as a shelter for evacuees from Hurricane Florence on Thursday, Sep. 27, 2018. During the storm, a pipe burst in the ceiling and caused extensive flooding inside the building. A fallen tree outside Trask Middle School in Wilmington, N.C., on Thursday, Sep. 27, 2018. The school building was being used as a shelter for evacuees from Hurricane Florence when a pipe burst in the ceiling and caused extensive flooding inside the building. 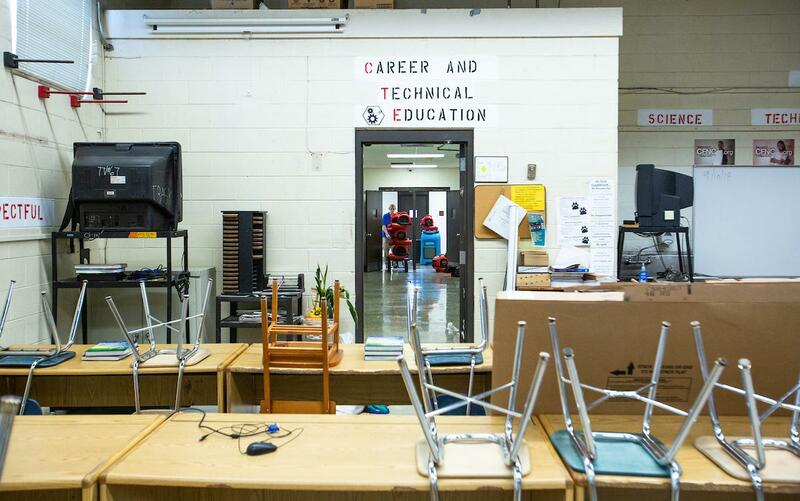 State education officials are still tallying up the damage to schools, but this week, the latest estimate had risen to $40 million in losses. "That is a big number and a lot of claims, and it's very difficult to say where that number will end up,” said Chief Officer of the North Carolina Public School Insurance Fund Eileen Townsend in her report to the State Board of Education.